This article is related to the article Playing the Enlightenment Card. “Spiritual Placebo” is a concept coined by Film maker Vikram Gandhi. He is a young East Coast American from an Indian family. 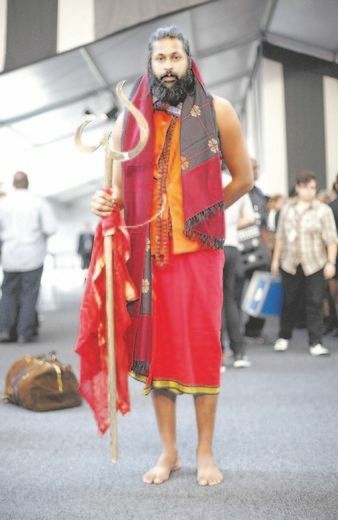 He is astonished by the success of Eastern-style gurus in the wealthiest parts of the world. As an experiment, Gandhi learns the trick of the yoga trade, dresses himself as a guru, lets his beard grow, adopts a thick accent, and sets off under the name Kumaré to the desert city of Phoenix, Arizona. There, he quickly gathers a group of followers around him, whom he teaches to meditate to catchphrases such as “Be all that you can be.” The tone of Kumaré remains lighthearted throughout. Despite taking his disciples for a ride, much in the style of Sacha Baron Cohen´s character Borat, he always treats them with kindness and sympathy. Kumaré also refers to himself as “The Mirror.” His method is the so-called Mirror Yoga (The Kumaré Method). What is interesting in connection with this article is that he also performs Shaktipat, and his followers report having precisely the same experiences as the Oneness Blessing followers (I´ll return to that). Clairvoyants and channelers claim to see his pure aura and chakras, and how an archangel is standing behind him, etc. So, where does New Age have this idea about subjectivism and relativism from? It doesn´t come from spirituality, but from the postmodern intellectualism on Western Universities. The scary thing about it, is how widely spread it is, creating hostility towards critical thinking. Management theory and self-help is accepted as a central part of EU´s project on lifelong learning and education. There exists no secularism when it comes to this psycho-religiousness – a global spreading totalitarian ideology which I under one has called The Matrix Conspiracy. Kumaré received fair reviews upon release. Many movie reviewers criticized Gandhi's deception as immoral, but partially forgave Gandhi for realizing that the experiment had grown out of his control. Many compared the character of Kumaré and the deception by Gandhi to Sacha Baron Cohen's Borat character and film. Those who liked the movie, like Stephen Holden of the New York Times and Roger Ebert of the Chicago Sun-Times, praised the film's message of "finding the guru within." Which is something I only partly can follow, because you also need outside teachers who have walked the path and can point out dangers and pitfalls, for example false teachings. Vikram Gandhi has used the concept of Spiritual Placebo. Does that mean that the whole concept of a true enlightened master is false? I have characterized Classical Conditioning and Placebo Effects as a thought distortion. Classical conditioning is a form of learning or physiological change. It is based on forming an association between a stimulus and a response. The association is remembered and affects future similar experiences. Some physiological responses to stimuli are unconditioned: they happen naturally and involuntary, like blinking, flinching, or the salivation response to the taste or odor of food. Other physiological responses are conditioned: for example, a dog can be conditioned to salivate when a bell is rung because the dog has been taught to associate the bell with food (Pavlov´s famous experiment). Dogs injected with morphine begin to salivate and can be conditioned to salivate from any injection, whether with morphine or not. Conditioning can involve much more than obvious factors like getting an injection, taking a pill, or being touched where it hurts. Conditioning can involve the theater of the medical setting and medical rituals, including the medical uniforms worn, medical jargon spoken, and medical gadgetry used. These conditions affect the patient´s expectation of relief from the treatment, as does the manner of the healer. Patient expectation, it turns out, plays a significant role in the effectiveness of many kinds of treatment. Therefore related to thought distortions such as Communal reinforcement and Subjective validation. The placebo effect should therefore never be seen as a valid "cure" for anything. Furthermore, the placebo effect often involves, as for example in NLP, New Thought and hypnotherapy, intentional manipulation of behavior and the inducing of certain worldviews, that are very problematic (see my articles Neuro-linguistic Programming (NLP) and Large Group Awareness Training (LGAT), The New Thought movement and the Law of Attraction, and Hypnosis, Hypnotherapy, and the Art of Self-deception). Also see my Matrix Dictionary entry on Joe Dispenza. Reversely it should only partly be seen as an invalidation of a true guru. But certain healing methods can also be extremely powerful in a demonical sense. In my article A Critique of Stanislav Grof and Holotropic Breathwork I mention the problem of spiritual crises provoked by such therapeutic methods. All this indicates ways of discriminate between a false guru and a true guru. When you have had a regular meditation practice for say, 2 hours a day for maybe twenty years, you´ll for certain begin to experience what is called progressive karma (see my article What is Karma?). The experience of progressive karma will provide you with discrimination: you´ll easily could discriminate between a false and true guru. You could also say that in a true guru there is no contradiction between teaching and way of life; there is no hypocrisy, well, in fact no thought distortions at all. Most of all: a true guru will radiate love. But the latter is tricky, because people would say that any charismatic person is radiating love. The thought distortion Subjective Validation is very powerful. So, radiating love is not a good argument. Avoid anything called “Crazy Wisdom.” It is clear that Kumaré´s “Mirror Method” could fit the concept of Crazy Wisdom very well. Crazy Wisdom (or Divine Madness – click here) quite certainly has a root in something authentic, but, as I have told many times, if anything can be abused within New Age, it will, for sure be abused. Sexual assaults and violent rages... Inside the dark world of Buddhist teacher Sogyal Rinpoche. In 2007, Sogyal introduced a programme that he called ‘Rigpa Therapy’, in which a number of qualified psychotherapists, who were also Rigpa students, were assigned to treat those entertaining doubts about the teachings. Drolma was among them. With this mix with Western Regression Psychotherapy and Cathartic Psychotherapy, you have a typical New Age model, where “Crazy Wisdom” can be used as a justification for abusing people “for their own good.” (see my articles Cathartic Psychotherapies, Regression Psychotherapies and The Vampirised Spirit of John Rosen. Also see my book Lucifer Morningstar – a Philosophical Love Story about spiritual vampires). Therefore, most important: You must develop the use of critical thinking, and study both yourself and the guru. Instead of focusing on whether the guru is radiating love or not, ask yourself the more philosophical question: Is this person a highly developed ethical person? Always remember Dalai Lama´s words about that you´ll never attain enlightened without developing an ethical mind. You can´t be ethical and unethical at the same time. It is a lie. In this context a good advice would be to study all sources of critique of the guru you can find. There will always be some critique, but if the bad things are overshadowing the good things, there is reason for consideration. As mentioned: Kumaré used Shaktipat, which is equivalent to the so-called Deeksha phenomenon. But without doubt: many times it is the euphorical ego-inflation, which lies behind the Deeksha phenomenon (transfer of enlightened energy or oneness-consciousness - see my article The philosophy of Karen Blixen about transmission of energy and consciousness – and my article The Ego-inflation in the New Age and Self-help Environment). The Deeksha phenomenon is today specially connected with the Oneness/Deeksha-movement, which is founded by Amma and Bhagavan, two Indian gurus, wife and husband, who claim they have created the entire Universe (and are the first 100% Avatars throughout history) and that mankind will get enlightenment only if we will cooperate with them. This movement spreads as a lightning these days, with slogans as: ”Become enlightened in 21 days!” (For a huge sum of money of course). Thousands of people walks around and are claiming they are enlightened, and themselves able to give the enlightenment forward to others. After you yourself have become ”enlightened” you yourself are becoming an ”Oneness blessing giver”, and ready to make money. You are even getting a certificate in this. Why on Earth waste time training yourself cognitional and ethical, when you after all just can have the enlightenment transferred by an Oneness blessing giver? In parenthesis remarked, then many of these ”enlightened” people never have experienced anything at all, but have become seduced into a web of lies, because the movement functions in that way, that you yourself shall get hold of new members by telling about how your life has been changed after you now have become enlightened – and you will after all prefer to keep a straight face to members you yourself have brought about. That is: they are also characterized by other forms of ego-inflation. The spreading of the message is functioning in precisely the same multi-level-marketing-sales-networking-way as Large Group Awareness Training programs (LGAT), The Law of Attraction and so on – see my articles Neuro-linguistic Programming (NLP) and Large Group Awareness Training (LGAT) and The New Thought movement and the law of attraction - probably because of the involvement of the famous American success coach Tony Robbins, who has trained the movement´s teachers in success coaching (read more about this in my article A critique of the Indian Oneness movement and its use of Western success coaching). Robbins says: “I built my fortune by modeling the success of others...Now you can copy my mindset and make your millions!” Tony Robbins is himself apparently a designated Oneness blessing giver, and oneness blessing is apparently a regular part of his seminars today. The mystics (for exampel Meister Eckhart, Tauler, Seuse) discriminated between “jubilatio” and “inflammatio”, the ecstasy and the inflammation. And the euphorical inflammation is dangerous, very dangerous (see my articles The Awakening of Kundalini and Spiritual Crises as the Cause of Paranormal Phenomena). The tools to be used against this ego-inflation is partially ground connection (Hara, earth bound work, preferably with other people, for example as a health care worker), partially again realization work, discrimination, humble separation of the ego and the spirit, between the ego and the rising, bubbleling, jubilant delight. Moreover ethical practice, training of compassion, for example Tonglen practice (in my book Meditation as an Art of Life – a basic reader, I have described both the Hara practice and the Tonglen practice in the supporting exercises The Harameditation and the Heartmeditation). Focus on yoga, Relaxationmeditation and Harameditation, and only keep the other exercises in mind. The most important though, is the development of Hara, which is fundamental to all wisdom traditions and natural healing professions. To all kinds of ego-inflation there are in other words some philosophical principles and supporting exercises you ought to hold on to. And generally it is good to have knowledge about the thought distortion called Truth by Authority. People from India has in style with Vikram Gandhi discovered how easy it is to get success in the West, by claiming they come from “the original” tradition. It should be unnecessary to say that today most Indians are as globally minded as Westerners. They are very well aware of what is going on. And in the same way as the rest of the world they take everything coming from USA at face value. Paramahamsa Nithyananda is a typical example (visit his website). On photos he is displayed almost as an exact copy of Kumaré. So, when you see his photos, and after having read this text, you might think it is a joke. It took me a while realizing that it isn´t a joke. I really tried to find material that revealed the hoax. But no, contrary to Kumaré, this guy is completely serious. What is special about him is that he, besides Deeksha, also teaches Law of Attraction as an ancient Indian practice. He is a full user of Playing the Enlightenment Card in that he claims himself not only to be enlightened, but also to be a divine Avatar. So, besides Bhagavan and Amma of the Oneness movement, we now have a third Indian Avatar, which disproves Bhagavan/Amma´s claim that they are the only two. 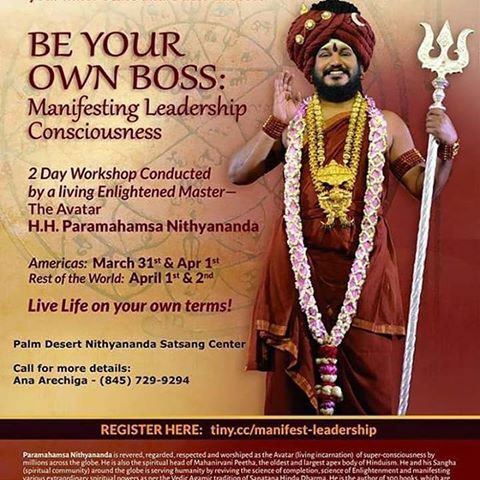 Paramahamsa Nithyananda also teaches quantum physics as a “proof” of his teachings – yes, he has discovered everything that can attract money from Westerners. The abuse of quantum physics is now so huge, that if you want to test a spiritual page for New Age infiltration, then you just have to make a search for Quantum Physics. What is brilliant about this test, is that the claim of the relation between quantum physics and consciousness is demonstrable wrong, which therefore shows that the claimer is logically proven to be a user of manipulation, or just simple ignorant (see my article Quantum Mysticism and its Web of Lies and the Matrix entries on Quantum mysticism and Observer (in Quantum Mechanics)). But the Law of Attraction wave is a phenomenon exclusively developed within a very narrow American Christian Movement as a reaction to the focus on suffering and negativity which is characterizing many Christians. It can only be understood fully when seen within this context. It is also developed within an environment of anti-intellectualism, which also only can be understood in an American context (see my articles Anti-intellectualism and Anti-science and The New Thought Movement and the Law of Attraction). By trying to mix all this with concepts from ancient Indian philosophy, Paramahamsa Nithyananda is the cause of enormous distortion and even destruction of this noble philosophy.